Multiple tipsters are reporting that Paisano’s Pizza at 8213 Georgia Ave. has closed, apparently for good. The Virginia-based chain of about 40 restaurants opened the Silver Spring outlet in May 2018. However, the operators of the local location had run into financial trouble even before opening, being sued for nonpayment of rent totaling about $71,000. 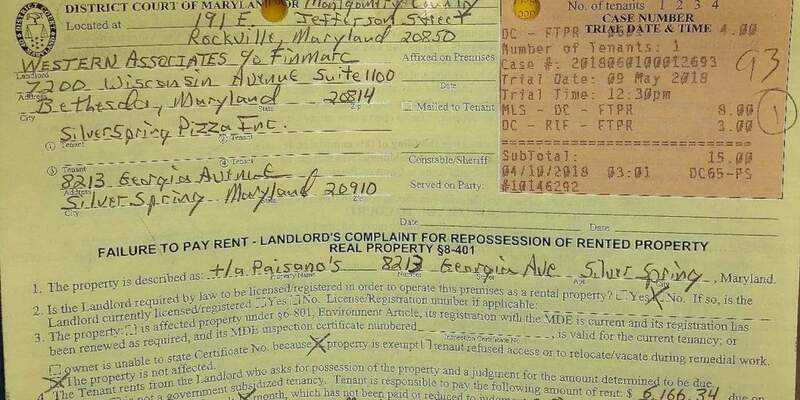 Another eviction notice was reported to the Source a few months ago. In addition to its pizzas and subs, the chain is known for its “Whatchu Want?” television commercial with Ryan Kerrigan of the Washington Redskins, former Redskins Brian Mitchell and Ken Harvey, Tom Wilson of the Washington Capitals and other local sports celebrities. Most recently, Paisano’s released a new commercial with the Capitals’ Andre Burakovsky and Devante Smith-Pelly. The company also had signed a deal in July 2018 to become the official pizza of the Washington Redskins. The 2018 court notice at the location of Paisano’s restaurant. Photo by David Lay. Good. Their illegaly parked delivery drivers created a constant traffic jam and safety issues. It’s not good. The alley has been blocked because of the apartment building development behind them. They had no choice but to pull up front. And, I’m sure now that they are gone it won’t suddenly become free of illegal parkers. was this a franchise and not a compnay store? because if they have sports celebs in their ads they have money.